Over the couple of days I will be posting photos of pelicans taken at Little Beach. This pelican was quite tame but still had his eye on me as I tried to take a close up shot of him. VML the detailed texture that you've captured so effectively. Wow what a fabulous closeup! Fav! Just been looking at June and July's shots Babs ( I've a lot of catching up to do) always love looking at yours especially. I've made a few comments but have loved them all. Great close up. He looks unreal. 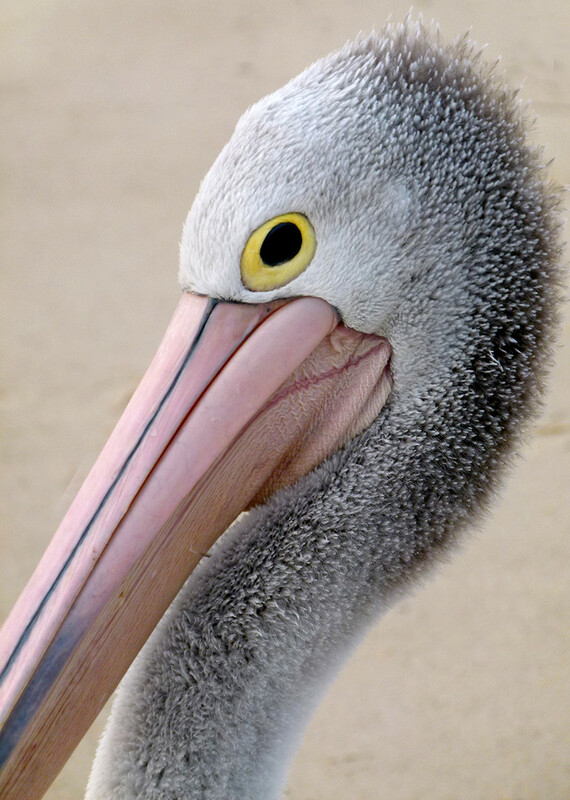 Great pelican portrait! You can see his thoughts, "This looks friendly, but I'm just not sure!" Only his mother could think him handsome! Odd looking birds but very photogenic! He's not looking best pleased Babs. Great capture of his head and particularly that spooky eye. The close up is almost abstract, I wonder if using black and white will be even more abstracting. Stunting portrait with great nice details. @annied @nicolecampbell @kjarn @dide @sarahlth @s4sayer @pusspup @beryl @gilbertwood @pamknowler @sangwann @chimfa @hermann @chloette @louannwarren @merrelyn @ludwigsdiana @henrir @joemuli @olivetreeann @danette @mittens @thistle @helenhall @hrs @craftymeg @carolmw @happypat @flowerfairyann @tonygig @yaorenliu @seattlite @suzanne234 @elisasaeter @Dawn @pyrrhula @loweygrace @bizziebeeme @jgpittenger @golftragic @mawol @megpicatilly Thanks so much for putting this gorgeous chap on the TP and the PP. He did let me get quite close to take this photo, but wasn't too sure about me. I think he was hoping I'd have a fish for him. Sorry for the group reply but I am putting together a photobook for our friend Lloyd whose birthday party we went to a few weeks ago and it is taking up most of my spare time at the moment. Such great textures but he competes wit the ugliness of turkeys I have to say! What an awesome close up! Fav! This awesome photo is on the TT this morning! Congratulations! Congratulations on this amazing photo making it to the Top Twenty! Very well deserving!